For my last few periods, at least one week prior (or 7DPO) to when Aunt Flow is supposed to arrive, I’ve suffered horrible cramping. Prior to having my mini-me, and during the time I was pregnant with her, I was diagnosed with low progesterone levels. I had to take progesterone in the messy suppository form for the entire first trimester to make sure my levels increased, thus, preventing a miscarriage. After doing some research, I figured that my severe cramping (dysmenorrhea) could be due to my having low progesterone levels. I forgot that while breastfeeding, your levels of progesterone decrease as well. Low levels of progesterone and too much estrogen causes menstrual cramps, backaches, headaches, mood swings, and irritability. Low levels of progesterone can induce contractions of the uterine muscles, which in turn, would cause cramping and rupturing of the uterine lining. In instances where you’re pregnant, the cramping and rupturing of the uterine lining can lead to miscarriage, which happened to me. Instead of paying $150 for a 10-day supply of progesterone suppositories (I used Endometrin) and since I only want to lessen the pain of the cramping I get before and during my period I opted to get some progesterone cream. 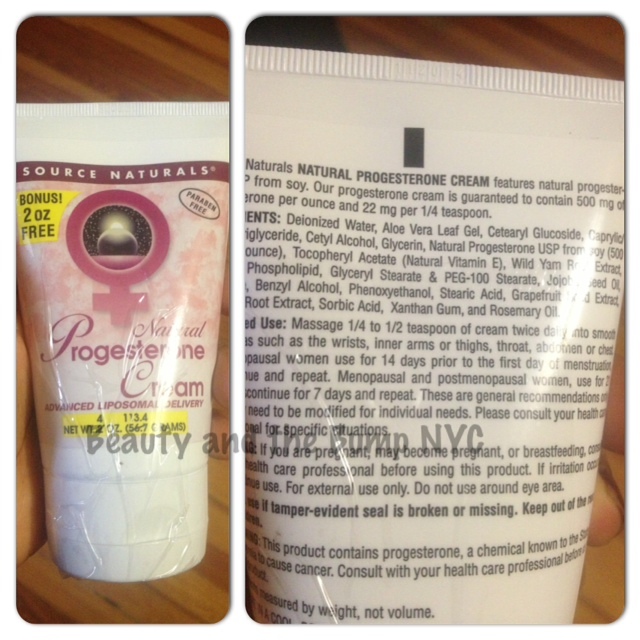 The Source Naturals Progesterone Cream 4 oz was $11.98, which was a steal compared to other places that sell it. Like the suppositories, it can be used once or twice per day. I like that the cream is used externally; therefore, it will not be as messy as the suppositories and is inexpensive. The cream is also paraben-free! When my next cycle begins, I will report back to let you know how it works or didn’t work. I am desperate for relief. Mild exercise like walking or biking. Exercise may improve blood flow and reduce pelvic pain. Use a heating pad or hot water bottle over your lower abdomen for intervals of not greater than 20 minutes. Be careful not to fall asleep on the heating pad. Get plenty of rest and reduce your exposure to stressful situations. Follow a diet rich in complex carbohydrates, like whole grains, fruits, and vegetables, but low in salt, sugar, alcohol, and caffeine. Drink a hot cup of regular tea, chamomile or mint tea (avoid mint tea if breastfeeding it will dry up the milk). Disclaimer: Information in this post should not be considered medical advice. My experience may not reflect that of your own. If you’re experiencing any of these symptoms, please speak with your healthcare provider before starting any supplements.